Ithilien, the Land of the Moon, was a fair, green region of Gondor on the borders of Mordor, comprising the whole eastern bank of Anduin from Emyn Muil to the River Poros. Enemy forces passed through Ithilien many times throughout its history, but the land retained much of its natural beauty. North and South Ithilien are demarcated by the Ithilduin river. Two great roads intersect just above the river in the Crossroads of Ithilien: Harad Road, which runs through Ithilien from the southern lands to Morannon in the north, and Royal Road, which runs alongside the Ithilduin from the city of Osgiliath to the Morgul Vale in the Ephel Dúath. Ithilien is known as the garden of Gondor. It is a land of lush vegetation, much of which had been planted by the Dúnedain but had grown wild over time. 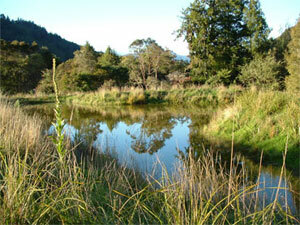 There are groves of ash, bay, cedar, cypress, fir, juniper, myrtle, oak, and olive trees. The ground cover includes heather, ferns, moss, and briars. Among the many flowers that bloom in Ithilien are anemones, celandines, hyacinths, irises, lilies, and wild roses. Herbs such as marjoram, parsley, sage, and thyme grow there as well. The air of Ithilien is fresh and fragrant. Warm sea air flows up from the south, while the land is sheltered on the east by the Ephel Dúath and to the north by the Emyn Muil. When the full Moon sets in the west, Ithilien bathes in a silver light. The Númenorean presence in Ithilien began with Tar-Ancalimon's grant of colonial status to Pelargir in II 2350, which gave the Faithful the right to settle the lands north of Harnendor. Because of its proximity to Mordor, settlement upon the eastern bank of Anduin grew slowly, and at first amounted to little more than defensive fortifications; but after the Downfall of Númenor, Isildur and Anárion agreed to settle the Vale of Anduin above Pelargir and its allied territories, so as not to disrupt the existing political arrangements. Many of the Faithful chose to accompany Elendil's sons, receiving land in exhange for pledges of allegiance to their father. This was the beginning of the seignorial system in Ithilien. The indigenous Daen-folk who were then wandering the Vale of Anduin were quickly subdued and incorporated into the new realm or withdrew into the Ephel Dúath. Unlike their brethren in the west, these folk did not retain any kind of autonomous clan organisation, but were absorbed into Isildur's feudal domain as peasants. With the notable exception of Hyarpendë, no large towns were founded in Ithilien south of Emyn Arnen; instead, the region remained a collection of manorial estates, interrupted by small villages, of which only few ever acquired township status and thus independence from the autarchy of the retainers of Isildur and their descendants. Between the Last Alliance and the Kin-strife, few wars touched Ithilien. The major source of unrest had been the subjugation of Harondor and Umbar. The absence of major conflicts allowed especially fertile Harithilien to develop into a wealthy and prosperous area and important contributor of grain surplus to the grain supply of Osgiliath and Pelargir. In Kin-strife, the people of Ithilien was split in half. More prosperous and populous southern half sided with Calimehtar's descendants and the traditionalist league, but landowners of Forithilien, fearful of Eastern incursions, supported Eldacar's claim to the Winged Crown. In the course of his reign, Castamir executed some of the nobles he thought were against him and had their estates distributed among his captains. He also replaced the Steward of Ithilien three times, in fear of shifting loyalties. When Eldacar regained his throne, he clamped down on the powerful Dúnadan families of Ithilien who had openly supported his nemesis. Many noblemen were imprisoned and summarily executed, but some managed to flee south of Poros and join forces with Castamir's sons. Eldacar restored land and titles to those who had proved themselves loyal to him during the Kin-strife, and ennobled many commoners as reward for courage on the battlefield, granting them estates formerly belonging to the traditionalists. This was seen as a grave matter by the ancient families who looked down upon the "upstarts". After Eldacar's death, nobility of Ithilien was without a doubt loyal to Aldamir, who put up a conciliatory face, but seeds of anger and division had been sown in the hearts of many. Rebel sentiment resurfaced in the 1650s, when the post-Plague kingdom was rocked by popular uprisings. Forty noblemen sided with Sangahyandion in his claim to the Winged Crown; others gave clandestine support. After years of hard struggle, Tarondor and his steward Dior Hurinion managed to stamp down rebellion. This meant, of course, new executions. But at this time the whole province was utterly ravaged, having seen invading and defending armies come and go, living off the land. 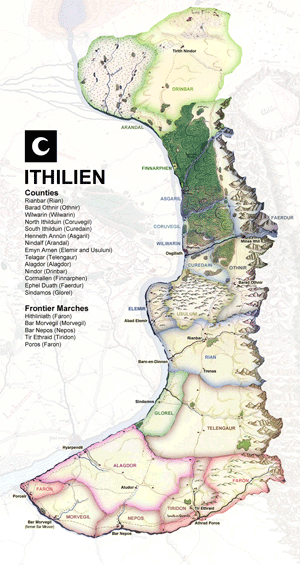 Province of Ithilien was establised in II 3320 by Isildur as his own feudal domain, settled with his followers. 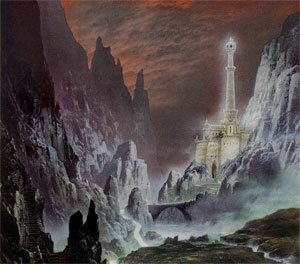 After Isildur's fateful departure to the north, Ithilien became a royal ward in the kingdom of Meneldil. In III 1641 the province was divided in two for administrative purposes. Tirith Nindor was established as the northern administrative center. Southern Ithilien (Harithilien), a land more akin to Lebennin or Harondor, was governed first from Athrad Poros and later Hyarpendë. Minas Ithil remained the capital of the whole territory. As a feudal domain, Ithilien by definition recognizes no other authority apart from that of the feudal lord (whether this be the king himself or one of his vassals). 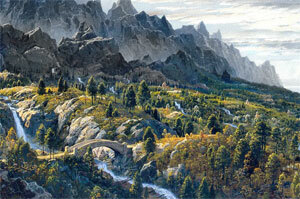 With a few exceptions, Ithilien is, in effect, nothing more than a patchwork of noble estates. As a Royal Ward, Ithilien is nominally ruled by a Warden appointed by King's government, but the Wardship has been an object of fierce factional strife. Recent Warden of Ithilien, Tuan Barandor, was sacked in 1666 after charges of conspiracy and corruption. Ithilien has been ravaged by plagues and wars, and cannot contribute much to Gondor's armies. About two thousand elite line infantry with few hundred horsemen is considered ideal maximum for the province. In addition, Southern Ithilien has been a hotbed of sedition. Twenty noblemen, all knights, were hanged during the Third Corsair War for high treason. Southern wing of the Royal Army (Dagorwaith Nethren) is permanently stationed in Ithilien. 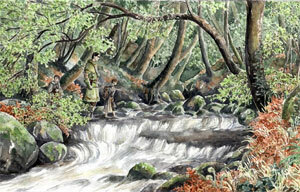 During the Kin-strife Ithilien was able to field 36,400 professional soldiers and 39,100 militia. Most of the exalted houses of Ithilien tried to keep out of the civil war. Alagdor and Miruvor, two southernmost counties, were first to revolt against King Eldacar and sent their banners to assist Castamir and the Lords of Pelargir. Telengaur, Rian and Othnir gave their lukewarm support to Castamir when he acknowledged King of Gondor. Other houses were loyal to Eldacar through the Kin-strife. These noblemen plotted, fought and shed blood with the Pretender Sangahyandion and were executed for their treason in the name of King Tarondor. There are currently 73 members of the Council of Gondor in Ithilien.